The magic of pulling the print (lifting the paper) to see your design emerge inspires new discoveries. Experiment with materials, texture and pattern to foster creative thinking. You never know exactly how your print will turn out and that is part of the magic and beauty of printmaking. 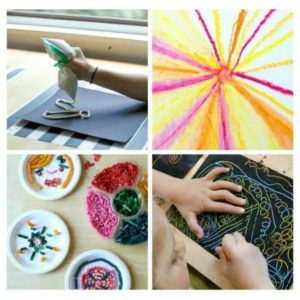 To start printmaking you do not need expensive materials or fancy supplies, which makes it a great art project to do with children. This tutorial will show you how to do rubber band printing using only three simple household materials :: cardboard, rubber bands and paint. Learn how easy it is to create custom designed prints and patterns. Be sure to read all the way to the end of the tutorial to see the brilliant idea my five year old suggested that transformed the final outcome of our project. Step 1: Cut the cardboard to your desired size. You can trim the cardboard to whatever size works for you. We used approximate 6” x 6” square cuts of cardboard. Step 2: Wrap the rubber bands around the cardboard. Experiment with thick and thin rubber bands or think about creating a pattern by how far you space your rubber bands apart. Step 4: Make your print. Turn the cardboard over and press it down on top of a blank sheet of paper. Press down and rub your hands over the entire cardboard shape. Step 5: Try overlapping different colors, designs or even printing on different types of paper. Encourage your child to experiment and try new combinations. Older Child Extension :: Cut slits into the sides of the cardboard square. Wrap the rubber bands in a diagonal pattern around the square and secure the rubber bands by tucking them into the slits. Child ­led art is really amazing. This printmaking tutorial gives your child the opportunity to take ownership and explore new ways to make marks on paper. After completing our rubber band prints using the above tutorial, my five year old really liked the look of the painted cardboard and rubber bands. He asked to add more paint to the cardboard. I was amazed that he noticed and appreciated the unique look of his cardboard square and that he wanted to continue working to turn it into a work of art. After the additional paint was dry, we loved the look of the painted rubber bands on the cardboard. My son beamed with pride as he showed off and presented his new work of art. Please note, the tempera paint will flake off the rubber bands. If you wish for a more permanent solution, use acrylic paint to paint the rubber bands. Once the cardboard paint dried we added a washi tape border to give the cardboard artwork a finished look. Each member of the family painted a square and we displayed the squares all together for a collaborative family artwork. If you are looking for more easy ways to try printmaking with kids be sure to check out our Monoprinting Made Easy for Kids. Jamie is a certified Art Instructor and a mother of three. Her website, Hand Made Kids Art, focuses on quick, easy and inspiring art activities to grow creative kids. It doesn’t matter if you only have 5 minutes or 20 minutes, you can find time to create art with your children. 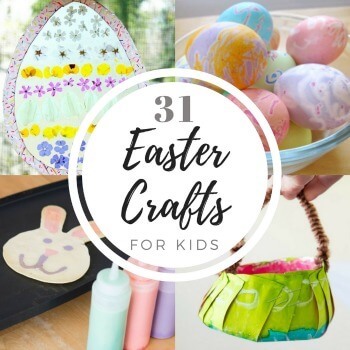 You can follow along with her art adventures at Hand Made Kids Art, Pinterest, Facebook, Instagram, and Twitter. Jamie also runs a free 6 week STEAM e-course (geared to the preschool age level but easily could be modified for older children).